How do I get the 2 path sweep to work? The source shape never aligns with the paths even trying various positions for the object axis. When done interactively, I can't get it to align precisely either. Please advise - file is attached. But this should also work with 2 path sweep! Why is there no option in 2path sweep to stay in place? And why is the profile mirrored and put out of place? I found the sweeps an absolute nightmare to work with, and normally abandon them, because end result is always screwed up. I agree that the sweep tool needs some attention to make it more intuitive, but I've learned it's "personality" better so I don't have many issues. Regarding your file, the paths have similar curved radii (in fact the out path is smaller than the inner) so I think it's expected that you'll get strange results. I would approach this shape differently such as rounding (to holdline) for example. That's assuming you want the radii sweep not as ADS example (which is more of a natural sweep). Two path sweep might be a little troublesome, but your shape is impossible anyway. You can't have such a smal radius on your outer path. 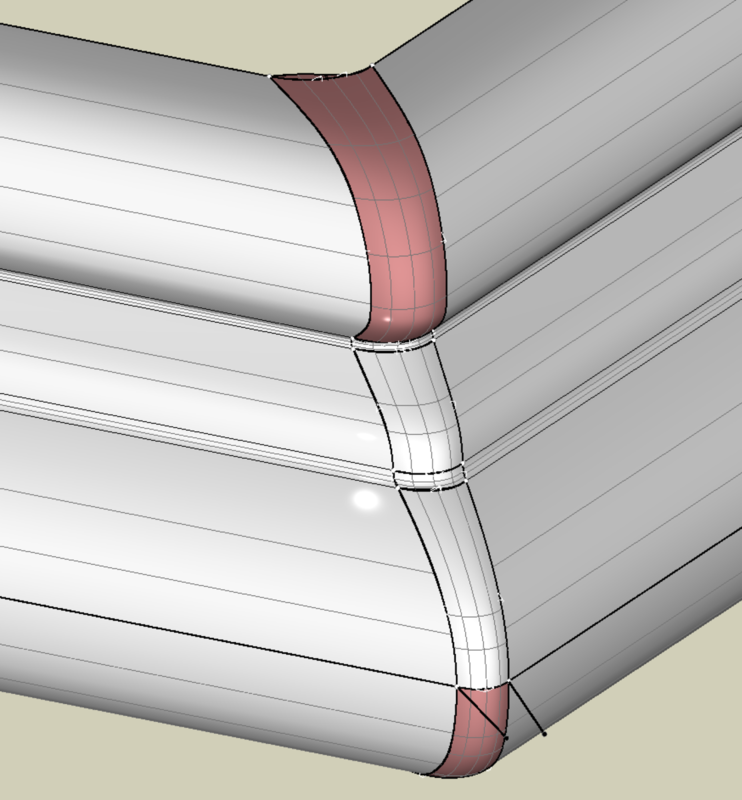 As a sweep the shape is impossible, but should be achievable by a laborious process of using NURBS for each line section of the profile. Will have to admit that this too is troublesome and requires a lot of trial and error. As well, as I suspect a bug in the process. Thanks for the replies. I wasn't getting email notifications. Yes, sure the axial sweep works but that doesn't change the radius from rear to front of the profile shape. Not sure why many are saying the shape is impossible as this model is to represent a granite counter edge. I haven't been able to use the 2 path sweep effectively since V6. Here is how I would approach it (though as mentioned above there does appear to be a bug or possibly a bug in my understanding). the three paths show a tighter radius on the outside of the profile sweep. Which again, using the sweep tools doesn't appear to be a natural way to do it. 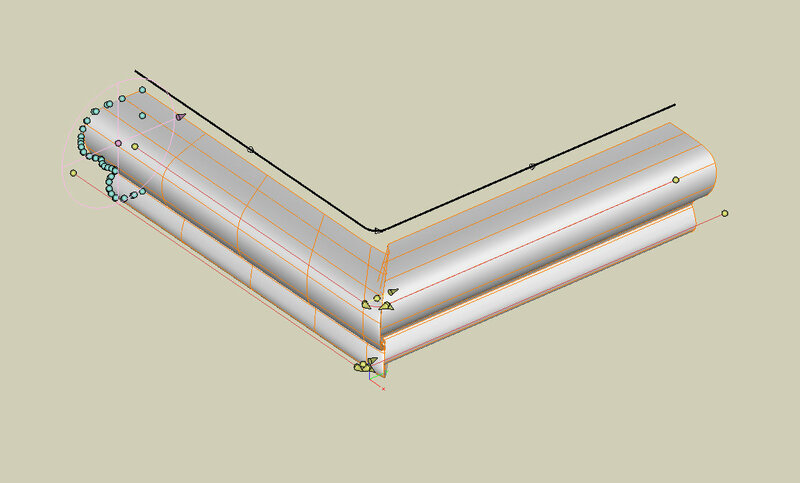 Using the Nurbs blend, you can manually loft each section. I have highlighted the problem areas that I am having with this method. The N-Bound tool. and possibly other tools could be used instead. This of course creates a "Loose" NURBS patch that has to be fully manually tweaked as opposed to a nice neat control vector.. but with some effort, can product a nice patch. (has a slight bulge that doesn't quite have the needed flow, but again can be tweaked to do so.) You may also be able to do some trimming processes to get everything to match up. I haven't completed the process of stitching everything together. by looking at the file, you should be able to glean how I approached the problem. Look at the ghosted objects. Des - I didn't think of rounding a 90° corner after the sweep. That should work. Thanks for the suggestion. Chris - thanks for the input. Your method is similar only with the use of Nurbs. I swear at one time I was able to get this shape using 2 path sweep. km, Well, the method used above is a lot more labor intensive than a sweep would be. Not sure if in the past it was possible. but thinking of the logic of how a sweep works I am not sure that it would. as a sweep keeps the shape off the profile consistent. The expected shape that you are requesting from the system can't do that. The profile shape has to stretch to achieve your desired shape. 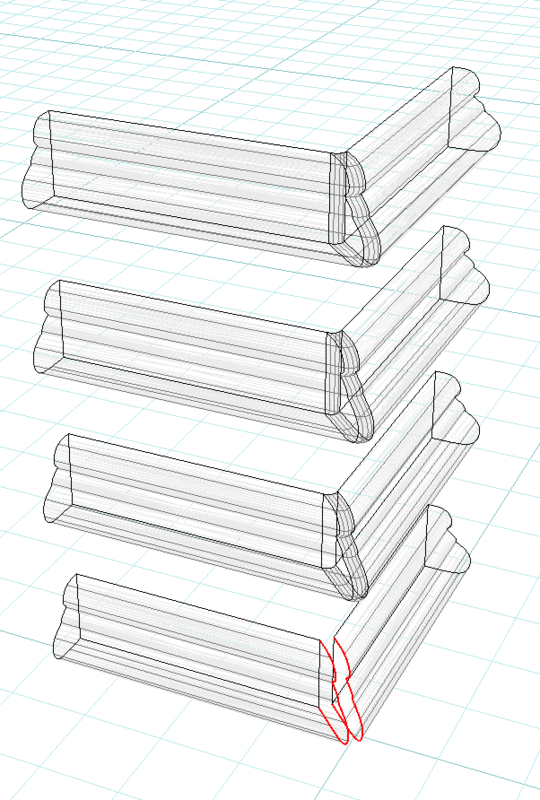 I simply cheated it by trimming an extrusion where you noted your radiuses to be. I too find the two path sweep unmanageable as it changes the location of the swept object to something other than the set/desired locations of the path. The edit capabilities of the tool isn't a useful replacement for getting it right in the first place. One reason why, is the ability of snapping the correct points. Quite irritating. I do think that the past tool for this did a better job. but can't confirm it at this time as I no longer keep an old version of the app on my system. vbaran - yes, that's it, however, it doesn't align with the paths. No matter what I do with the object axis or the interactive controls, I can't get the alignment I need. Chris - vbaran'd example above shows that it is possible for the 2 path sweep to provide the two radii. Now if only I could get the result to align with the paths. Skinning the cat another way, cheated by reconstructing the multiple curves into a single nurbz curve and then blending them to form the radius fill; but the end result is very similar and is a clean solid. How did you skin it?